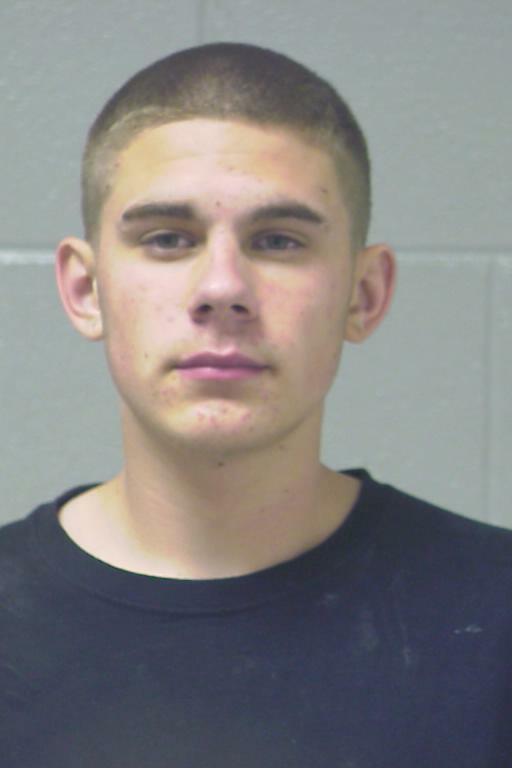 An 18-year-old Garfield Ridge man has been arrested and charged in connection with a strong-arm robbery that occurred at 12:25 a.m. Friday, June 15. Nicholas Ivy is allegedly one of four men who robbed a 20-year-old Clearing man as he was walking near 58th and Nashville. The victim told police that Ivy and another man held him while a third attacker punched him in the face and a fourth attacker kicked him in the ribs. After beating the victim, the attackers went through his pockets, stole $30 cash and fled west on 58th Street. The victim then went to a house near 58th and Natoma, asked for help and called 911. Police sent a "flash" message with a description of the attackers---described as white men ages 18-21, similar height and weight. A police unit spotted Ivy near his home at 57th and Melvina, apprehended him and brought him back to the crime scene---where the victim identified him as one of his attackers. Two thugs made off with $20 after robbing the Sunview grocery store, 6110 West 63rd Street, at 8:05 p.m. Thursday, June 14. A 23-year-old cashier told police that two men entered the store and attempted to buy a bag of Doritos corn chips, but claimed they didn't have enough money. They left the store, but came back a short time later to buy the chips. As the transaction was nearly complete, one of the men pointed a black pistol at the cashier and walked behind the counter, ordering her out of the way as he went through the cash drawer. The other man acted as a look out. The grocery store's owner, a 27-year-old man, was in the back of the store at the time. He told police he heard a loud noise; and when he walked to the front of the store to investigate, the criminals ran out the front foor and fled east on 63rd Street. The cashier described one robber as a white man, 5'9 to 5'11 and 160-180 pounds, 18-20 years old, medium complexion. She described the other as a white Hispanic man, 5'6 to 5'8 and 200-230 pounds, with black hair and a dark complexion. One of the two has a tattoo on his neck, according to the cashier. Burglars pried open the service door of a garage near 49th and Leamington, but were apparently frightened off and failed to steal anything inside. The crime was discovered by the victim, a 45-year-old man, at 12:30 p.m. Thursday, June 14. He told police he heard a loud noise in his back yard and went out to investigate. He also claimed that his neighbor's garage was recently burglarized and that a street gang has been tagging garages in the area. A 24-year-old West Lawn man was beaten with a bottle at 1:45 a.m. Saturday,June 16 on the sidewalk in front of 3725 West 59th Street. He and his girlfriend, a 24-year-old Back of the Yards woman, were walking down the street when they were approached by a man who asked if the victim is a gang member. When the victim denied being in a gang, the attacked struck him in the face with a bottle before fleeing. The victim was taken by Chicago Fire Department ambulance to Holy Cross Hospital, where he was treated and released. The victim described his attacker as a black Hispanic man, 25 years old, 5'5 and 180 pounds. An 18-year-old Gage Park woman riding in the back seat of her boyfriend's car was injured when a group of thugs used an aluminum baseball bat to smash the window next to her and hit her in the back of the head. At about 10:00 p.m. Friday, June 15, the car was traveling south on Hamlin and stopped at a stop sign at 57th Street. A group of hoodlums approached, shouting gang slogans and demanding to know her gang affiliation. When the boyfriend said she was not involved with any gangs, the attack began. The boyfriend drove the victim to Holy Cross Hospital, where she was treated and released. The man who swung the bat was described as a white Hispanic man, 18-20 years old, 5'4 and 150 pounds, wearing a blue shirt and blue jeans. An 18-year-old gang banger from West Lawn was beaten by thugs from a rival gang at 2:27 a.m. Sunday, June 17 on the street in front of 3659 West 64th Place. The victim told police he and his friend---also a 22-year-old gang member from West Lawn---were riding home when they began to be chased by men in a newer red Dodge Durango SUV, which rammed the victim's vehicle and forced it to stop. Several men jumped out and ran to the victim's vehicle, dragging him out and beating him with their hands and a baseball bat. They then got back in their SUV and drove away. The victim said his attackers were from a rival gang. The victim was transported by Chicago Fire Department ambulance to Christ Hospital and Medical Center. His friend described the attacker only as a white Hispanic man, 18-22 years old. Further, police say, the friend refused to cooperate with the traffic crash investigation. A 27-year-old West Lawn man was robbed of his wallet and debit card just outside the Chase Bank ATM booth at 5687 South Archer, at 1:50 a.m. Sunday, June 17. A robber walked up to him, drew a black handgun and demanded his wallet and card. He then fled north on Latrobe. The criminal was described as a white man, 30-35 years old, 5'6 and 180 pounds, fair complexion, wearing a blue, Chicago Cubs hooded sweatshirt and blue jeans, and with his face obscured by a white bandana. Burglars entered a garage near 62nd and Komensky and stole a laptop computer belonging to BMO Harris Bank. The crime was discovered by a 31-year-old woman living at the address, at 9:00 a.m. Friday, June 15. She is an employee of BMO Harris and told police that no sensitive information was stored on the computer. An 18-year-old Archer Heights man who declined to lend his cell phone to a trio of thugs was hit in the back of the head twice with a crowbar. The attack occurred at the Shell gas station at 5500 South Pulaski at 4:30 a.m. Thursday, June 14. The victim's family drove him to Holy Cross Hospital, where he was treated and released. He described the three criminals as black men, 18-21 years old, 5'7 to 5'9, brown eyes and black hair. Burglars entered a garage near 61st and McVicker and stole a set of golf clubs, a lawn mower, two car rims, and two Coach purses. The crime was discovered by the victim, a 27-year-old woman, at 7:00 a.m. Wednesday, June 13. There was no sign of forced entry, and the victim told police she suspects the crime was committed by an ex-boyfriend who has a key to the garage, and against whom she has an order of protection. Burglars entered an unlocked side window of a home near 52nd and Ridgeway and stole a laptop computer, a digital camera, an iPod touch, two Nintendo DS game consoles, 10 Nintendo video games, assorted gold jewelry, and a power tool set. The crime was discovered by the victim, a 39-year-old man, at 4:00 p.m. Wednesday, June 13, when he returned home and saw the front door open. Burglars broke into a garage near 62nd and Keeler and stole a lawn mower, a leaf blower, a weed trimmer, two tool boxes with tools, four auto ties, three patio tables, five patio chairs, a punching bag and an automatic garage door opener. The crime was discovered by the victim, a 48-year-old man, at noon Tuesday, June 12. Burglars broke through the rear door of a home near 65th Place and Springfield and stole a laptop computer, a cell phone, assorted jewelry and $600 in cash. The crime was discovered by the victim, a 27-year-old woman, at 3:00 p.m. Friday June 15, when she returned from shopping and noticed her home "messed up," although she did not initially suspect a burglary. She cleaned up the mess and only later realized that items were missing. Police were told by a neighbor that she has seen a man walking through a gangway with a laptop computer and then get into a black car with two others. The car then headed east, in reverse, toward Springfield. She described the men as three white Hispanics, 19-21 years old. Burglars entered a garage near 51st and Central and stole a welding machine, a power drill, a power saw, a weed trimmer, and a car radio (from the car parked inside). The crime was discovered by the victim, a 41-year-old man, at 3:00 a.m. Thursday, June 14. There was no sign of forced entry. Burglars forced open the service door of a garage near 48th and Kilpatrick and stole a set of chrome wheels. They also smashed the front passenger window of a 2002 black, four-door Lincoln Continental parked in the garage and stole the car's stereo. The victim, a 26-year-old man, was alerted to the crime at 5:00 a.m. Thursday, June 14 by a neighbor who told him that his overhead door was open. Want to work directly with Chicago Police to prevent crime in your neighborhood? If you live in Beat 811 (see map above), come to Good Shepherd Church, 5556 South Merrimac, at 7:00 p.m. Tuesday, June 19 and attend your monthly CAPS meeting. If you live in Beat 813 or 833, come to West Lawn Park at 7:00 p.m. Tuesday, June 26. Hear updates on crime in your neighborhood and learn how you can work with neighbors and police to make the community safer and better for all.